Ocean aquaculture is the raising and harvesting of finfish, shellfish, or seaweed in a controlled setting in the ocean such as a longline, netted pen, or raft. Aquaculture has a long history in the states and Tribal Nations of the Mid-Atlantic region. 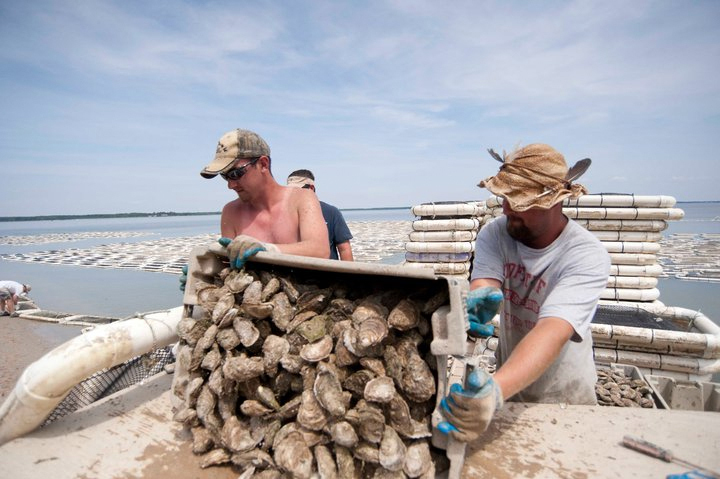 Virginia has leased shellfish beds since the 1800s. In the 1860s, salmon aquaculture was advanced in upstate New York. Today, aquaculture in the Mid-Atlantic primarily focuses on shellfish (oysters and clams) and occurs predominantly in bays and estuaries. In addition to providing food for people, aquaculture is an important tool for stock enhancement of valuable commercial and recreational marine fisheries, restoration of threatened and endangered species, and restoration of marine habitats (NOAA-Aq). Many Tribes such as the Shinnecock, Pamunkey, and Seneca operate shellfish and finfish hatcheries to seed or stock natural populations. In the Mid-Atlantic region, no aquaculture is conducted offshore in federal waters at this time, primarily because the state waters along the coast provide proximity to land-based infrastructure and more sheltered and stable conditions (Lapointe 2013). Because Mid-Atlantic ocean aquaculture currently occurs only in nearshore waters, databases on aquaculture locations are maintained by the states. Geospatial data for aquaculture in state waters are available online for Suffolk County, New York, Maryland, and Virginia. Offshore aquaculture will likely continue to develop at many scales and with regional approaches (Rubino 2008). The NOAA Aquaculture Program reports that U.S. marine aquaculture production is now growing steadily about 8 percent per year (Draft Strategic Plan 2015). One of NOAA’s future goals is to maintain or develop interagency offshore aquaculture working groups in regions where offshore aquaculture is underway or being proposed. In January 2016, NOAA published a final rule to implement a regional fishery management plan for aquaculture in federal waters of the Gulf of Mexico, which could provide a model for other regional fishery management councils that may be interested in setting up a comprehensive regulatory program for aquaculture in federal waters. The NOAA Greater Atlantic Region’s Aquaculture Lab in Milford, Connecticut, studies impacts of ocean acidification on aquaculture, benefits of shellfish aquaculture to habitat and water quality, and effects of shellfish harvesting on the seafloor environment. The idea of co-locating offshore mussel aquaculture and wind energy facilities has been discussed in some states, and a recent study explored potential impacts of cost-sharing and social benefits of cooperation between these industries (Griffin et al. 2015).